Once again, I am participating in a fabulous bookish survey held by none other than Jamie at The Perpetual Page-Turner. I always think her end-of-year surveys are a blast, so I'm quite happy that the tradition has been continued for 2014! Unfortunately I tend to not read as much as most book bloggers so there are quite a few repeats as some books fit into several categories. Enjoy! My complete list of the best books I read this year is right here. Pride and Prejudice by Jane Austen. Please don't yell at me. I was SO EXCITED to finally read it... But I just found it incredibly dispassionate. I like to feel all the feelings when I read, but that just didn't happen with this classic. I couldn't believe Elizabeth feelings for Mr. Darcy in the end. I suppose when it comes to 'soap opera' classics I'll have to stick to the Bronte sisters. I was really surprised by how much I loved Marissa Meyer's Cinder. I didn't think I'd enjoy it nearly as much as I did - in fact, I adored it. But The Killing Moon by N.K. Jemisin also surprised me - I wasn't too sure what to expect before opening it, and it ended up being way more unique than I anticipated. I'm not much of a book pusher... Primarily because I don't know many people who read as much as I do. But I did buy my bestie Marcelo in the Real World by Francisco X. Stork for Christmas; hopefully he likes it. Anne Bronte, David Mitchell, Marissa Meyer, and the team of Amanda Dirlam and Melanie Overmyer. -I usually don't read fairytale retellings, but I finally bought Cinder by Marissa Meyer - and I absolutely love her Lunar Chronicles series. These are fairytale retellings done right! -In fact, I typically don't do retellings period, but I tried Black Spring by Alison Croggon (which is a Wuthering Heights retelling). It wasn't fantastic by any means but it wasn't bad. I was gulping Marissa Meyer's Scarlet and Cress whole. If the next Changeling book comes out this year, I'll likely reread Crossing the Threshold to refresh my memory. Marcelo in the Real World by Francisco X. Stork. It's incredibly beautiful. 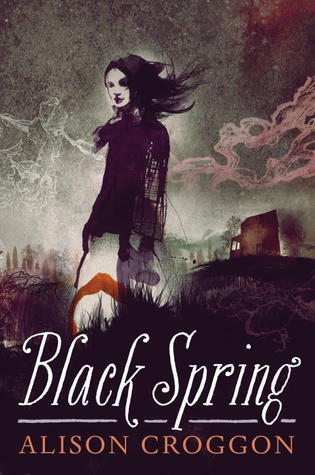 Black Spring by Alison Croggon takes second place; it's so creepy and awesome! Oh goodness, there were so many fantastic characters... Basically everyone from the Lunar Chronicles series by Marissa Meyer, Lucy Snow and Paul Emmanuel from Villette by Charlotte Bronte, Somni-451 from Cloud Atlas by David Mitchell, and Marcelo from Marcelo in the Real World by Francisco X. Stork. The Bell Jar by Sylvia Plath, Their Eyes Were Watching God by Zora Neale Hurston, Night by Elie Wiesel, and Villette by Charlotte Bronte. George Orwell's 1984 was definitely the most thought-provoking. And scary. Of course, Elie Wiesel's Night always provokes some thought and it definitely changed me the first time I read it. Marcelo in the Real World by Francisco X. Stork. That needed to happen YEARS ago. Shortest: The shortest novel I read was Night by Elie Wiesel at 120 pages, but if plays and short stories are included, I read Oscar Wilde's The Importance of Being Ernest at about 70 pages. -The ending of Villette by Charlotte Bronte... Did she really just end this book like this? Yep, she did. Unconventional and genial storyteller that she is. -Weirdly enough, finding out who exactly Wolf is in Scarlet also surprised me because it had been a while since I read Cinder and the obvious answer wasn't catching my attention. I know, I don't understand how I didn't see it coming either; it was pretty obvious. Cinder and Thorne! (From Scarlet by Marissa Meyer.) Their contrasts are so fantastic! But I also love Cinder and Iko; they're best friends for life. Villette by Charlotte Bronte - I adored Jane Eyre when I read it a couple years ago and determined that I will everything by Charlotte and her sisters, and one of the books by them I was most eager to read was Villette. It's such an unconventional story even by today's standards... It's genial, really. I was also really impressed by A Million Suns and Shades of Earth by Beth Revis. Her Across the Universe trilogy is fabulous through and through, and I suppose if I had to choose between the two, I'd pick Shades of Earth because it's so different yet so full of intensity and mystery all the same. I was really impressed by how Revis handled it. There is a story in Naoko Takeuchi's Sailor Moon Short Stories 2 called "The Lover of Princess Kaguya," and I absolutely loved it. I've always loved it since I was little and saw the Sailor Moon Hearts in Ice movie. Their Eyes Were Watching God by Zora Neale Hurston. I only read it because one of my teachers highly recommended it. I didn't know anything about it when I started reading it, and I was pleasantly surprised. It's very good. Wolf from Marissa Meyer's Lunar Chronicles series. Crossing the Threshold by Amanda Dirlam and Melanie Overmyer. This is a short self-published book which is the first in a trilogy. I really enjoyed this one; I've never read a fantasy that felt so contemporary before, and I love that. (It sort of reminds me how Annette Curtis Klause writes her paranormal romance novels to flow like contemporaries, and I love me some Annette Curtis Klause.) The characters may seem typical at face value - the nerdy, unpopular girl and the jock with a more sensitive side - but they're actually much more interesting than that. I could relate to Shea in ways I can't relate to other characters. 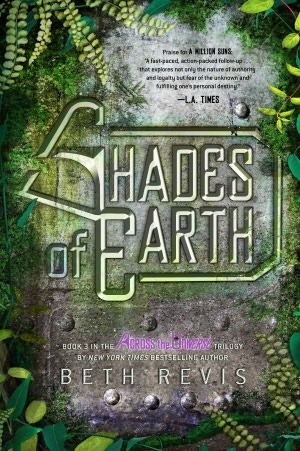 Shades of Earth by Beth Revis. I don't want to spoil anything for those who haven't read these, so I'll just have to keep my mouth shut on this one. -Scarlet by Marissa Meyer, because of all of Thorne's dialogue. And Iko is always adorable. -My Life Next Door by Huntley Fitzpatrick, because George is so adorable! Night by Elie Wiesel. Again. It's a Holocaust autobiography, so it's only natural that the tears would come. And Wiesel's beautiful writing doesn't help matters much in the emotional department either. Their Eyes Were Watching God by Zora Neale Hurston... Because it's just not fair. Although I acknowledge that even though it's sad, (I'm trying really hard not to spoil) it's good that a certain character was able to find what they were looking for. But it's still not fair. I actually cried a lot at the end. Villette by Charlotte Bronte had me tearing up a smidge at the end, but I know it's not supposed to be sad. The point is that the character can let go and be independent... But this really wasn't fair either - to the point I reread the last four pages like half a dozen times before I could really believe what just happened. Charlotte Bronte, why do you play with my soul so much? I read quite a few "hidden gems" this year. I don't understand why more people aren't reading these - they're all fantastic books! Marcelo in the Real World by Francisco X. Stork - Marcelo is a contemporary about a boy with autism who hears music in his head as he finally dives into the "real world" and realizes that it isn't all that great. The blend of feelings is just right. Crossing the Threshold by Amanda Dirlam and Melanie Overmyer - Crossing the Threshold is the first book in these 2014 debut authors' Changeling series about two teens with a larger purpose than they realize who are pushed together by some outside force. It's basically a contemporary/fantasy... Yes, I just said a contemporary/fantasy - that in itself should be an incentive to go buy a copy and start reading! The Tenant of Wildfell Hall by Anne Bronte - Poor Anne just gets no attention in the grand scheme of Brontemania. The Tenant of Wildfell Hall is such an important feminist novel, AND it's interesting and has some of those heavy Bronte-esque emotions. Villette by Charlotte Bronte - Charlotte is really just popular for her classic novel Jane Eyre, but Villette is also a profound piece of literature. I realize that the first half is pretty slow and it isn't initially grabbing as Jane Eyre is, but Charlotte really accomplished something here; this book is WAY ahead of its time, and it's even beyond the time we're currently in. For the most part, my soul is unscathed by the books I read in 2014, except for Elie Wiesel's Night. My heart was mostly what took the impact. Villette by Charlotte Bronte - Like I said, this book is beyond our time. I've never read a book with such a plot... The way it ended, the emotional note it ended on... It's not what anyone would've expected. Ever. Crossing the Threshold by Amanda Dirlam and Melanie Overmyer - It's a fantasy that flows like a contemporary. There are a lot of Irish influences. AND I can relate to Shea in ways I haven't been able to relate to other characters. Needless to say, this book is one of a kind. Cloud Atlas by David Mitchell - A series of stories intertwined because of reincarnation? Not that unique. All the stories are completely different genres and are written to suit each genre? Incredibly unique. The Killing Moon by N.K. Jemisin - This story is about a mock-Egyptian society, and I've never read such a fantasy before. The concept of dreamblood and all of that other complicated stuff that I'm struggling to remember (it feels like forever since I've read it) made for a very interesting and unique story. My Life Next Door by Huntley Fitzpatrick - Samantha's mom. 'Nuff said. Revealed by P.C. Cast and Kristin Cast - Zoey needs to get it together. But, considering the next (and final) book of this series is called Redeemed, I imagine she'll be, well, "redeemed." Marcelo in the Real World by Francisco X. Stork - The way that certain characters treated Maracelo because of his autism is bound to anger anybody. The worst part is that there are people who are like this in the "real world" outside of this book. I don't really have favorite reviews... But I suppose I'll say my review of Epica's latest album The Quantum Enigma is my favorite because of how happy I was as I was listening and writing. Probably my concerts post because it was the most fun to write. Going to concerts is one of my most favorite things I life; it's about time I shared some thoughts about my experiences. I got to go to a local Q&A event in which Amanda Dirlam and Melanie Overmyer talked about their debut novel Crossing the Threshold. Discovering that two of my favorite former teachers (Dirlam and Overmyer, as mentioned above) wrote a book and being able to read and review the manuscript before it was released was awesome! I'm so proud of them! And I promise that the fact that I know the authors personally didn't sway my opinion on the book whatsoever. If I didn't like it, I wouldn't have praised it as highly in my review or in any of these categories. 1 - Tuomas Holopainen of Nightwish Releases First Solo Video: "A Lifetime of Adventure"
Some of my poor book reviews just have a lack of love, particularly Marcelo in the Real World by Francisco X. Stork, The Dark and Hollow Places by Carrie Ryan, and My Life Next Door by Huntley Fitzpatrick. -HALF PRICE BOOKS. It's the most amazing store that could ever happen to the bookish world. Unfortunately all the Half Price Book stores are far away from me so I always have to make a bit of a road trip. But, when I went there, I got a paperback for $4 and a hardcover that's usually $40 for $6. While I was there, I sold some books and got $8 out of it... So I got a $35 purchase for $2. You just can't beat that. I just try to read 20 books a year or more (I know, it's low) and I did it. The Bone Clocks by David Mitchell. After reading my first book by him this year, I can't wait to see what Mitchell has in store! And I also really need to read Redeemed by P.C. Cast and Kristin Cast. And Thorne of Glass by Sarah J. Maas. And - okay, I'll stop now. All of the next Lunar Chronicles books by Marissa Meyer (Fairest and Winter) and The Last American Vampire by Seth Graham-Smith, which is a sequel to Abraham Lincoln: Vampire Hunter. I'm really anxious for the sequel to Crossing the Threshold in the Changeling series by Amanda Dirlam and Melanie Overmyer as well as Winter by Marissa Meyer. Stay consistent with the post flow. I was SO GOOD at this year - SO GOOD, I TELL YOU, FOR THE FIRST TIME EVER. But then university happened and I only posted once in October. Fail. Furthermore, I need to find balance between reading for school and reading for fun, because it just didn't happen during my first semester at the university. Like, at all. Again, I don't get ARCs. I hope everyone's having a great new year!